Imagine this scenario. It’s the day of your cruise, you wake up early, head to the airport and check in. You’re at your gate with plenty of time to spare. And then you see the words no flyer wants to see: delayed. Between weather, congestion, or a breakdown, there are any number of reasons a flight can get delayed (or cancelled) these days. And if you are planning to fly into the Mobile the day of your cruise, you run a big risk of having a delay mean you miss your ship. What if you aren’t flying? After all, many people drive to the port. We think driving is much safer when it comes to delays. After all, if there is a blocked road, there is always an alternate route. Still, it’s always nice to arrive in your port city well in advance of your cruise so that you aren’t stressed worrying about missing the ship. That’s why we always recommend coming into the area the day before your cruise. This provides you with extra time and reduces the stress of trying to make your cruise on time. Of course, that means you need a place to stay. If you are only staying one night, we recommend finding a hotel near your cruise port. This way you don’t have to worry about traffic in getting to the port on cruise day. It’s also nice in that it allows you more time to wake up and get ready for your trip, including having a few extra minutes to run any last minute errands for things you might have forgotten. 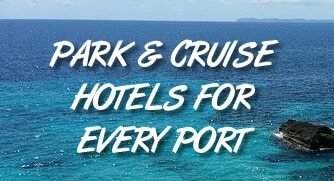 To help you out, we’ve rounded up a list of hotels in the immediate vicinity of the Mobile cruise port. This isn’t meant to be an exhaustive list. Instead, it’s those hotels in the area rated “Good” or higher by Kayak.com and are only a short distance away. Prices are for a recent search for a Saturday night stay and are subject to change. Click any hotel name to be taken to reviews on TripAdvisor.com. Note: This article contains affiliate links to TripAdvisor. We earn a commission for clicks made on their website, at no charge to you. We don’t provide personal recommendations as we have yet to stay at any of these hotels. However, keep in mind that all of these are rated “Good” or better, based on dozens (if not hundreds) of reviews from travelers like yourself. Any of them within your price range will be good options and reasonably close to the port.